Students will deepen their understanding of the five basic emotions: happy, sad, angry, surprised, and disgusted by practicing expressive and receptive identification of these vocabulary words as they participate with peers in a game of Go Fish. 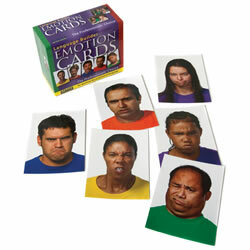 Stages Learning Materials Language Builder Emotion Cards. 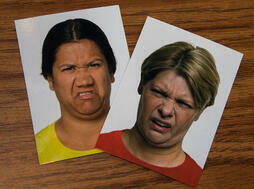 - For this activity, you will need to pull the 40 cards that show the people in front of a white background. These are the only cards you will use for this lesson. 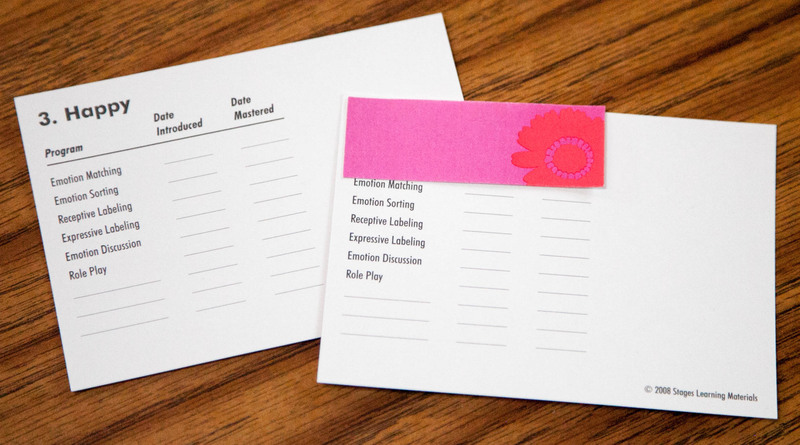 - Depending on your students’ reading ability, the back of each card may need to be covered to hide the emotion label. I recommend using the top portion of a Post-It note (the sticky part) or using Scotch Removable Magic Tape to tape a small paper over each label. - Students with fine motor difficulties or who don’t like holding the cards may benefit from the use of a card holder for their cards. - Some students may benefit from a “cheat sheet” listing the 5 emotions used in the game (with pictures supports if needed) to reference during game play in order to remember which emotions are being learned. See an example here. 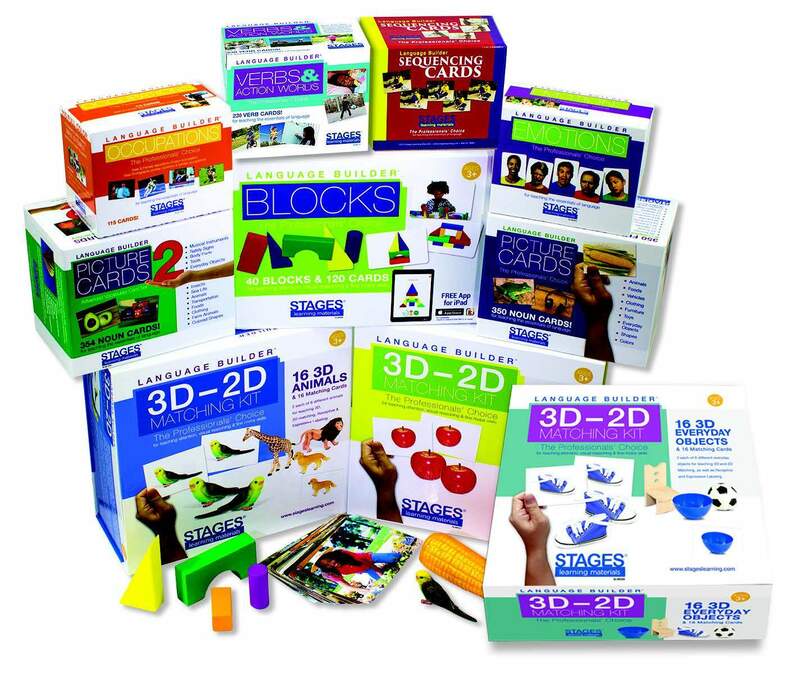 This game is best played with 2 – 5 students, with staff support as needed. This game can support up to 7 students if each player receives 5 cards in their “hand”. However, with 7 players there will only be 5 cards in the “pool” (see Set Up below) so the pool may run out quickly. Staff support is to ensure that the rules are being followed as well as to facilitate appropriate social skills and turn taking. Staff can also support conversation during game play that is relevant to the emotions being discussed. Students should sit around a table so that they can see one another. The 40 cards should be shuffled and distributed to students so that each player has 5 cards (or less, if that is what has been decided upon prior to the game beginning; see People above). The remaining cards are placed in the middle of the table facedown and are referred to as the “pool” (or pond, or ocean, etc.) for the remainder of the game. This is where players will pick a new card if told to “go fish”. - 8 cards per match = 5 matches. Each emotion will have 1 match. - 4 cards per match = 10 matches. Each emotion will have 2 matches. - 2 cards per match = 20 matches. Each emotion will have 4 matches. I recommend using 2 or 4 cards per match as that allows for more overall matches and increases the likelihood that each student gets at least one match throughout the game. It also makes physically managing the cards a little easier for students, as they don’t have to hold on to/keep track of as many cards before being able to put down a match on the table. Once each student has their cards, the players should begin to identify the emotions depicted on the cards they were dealt. 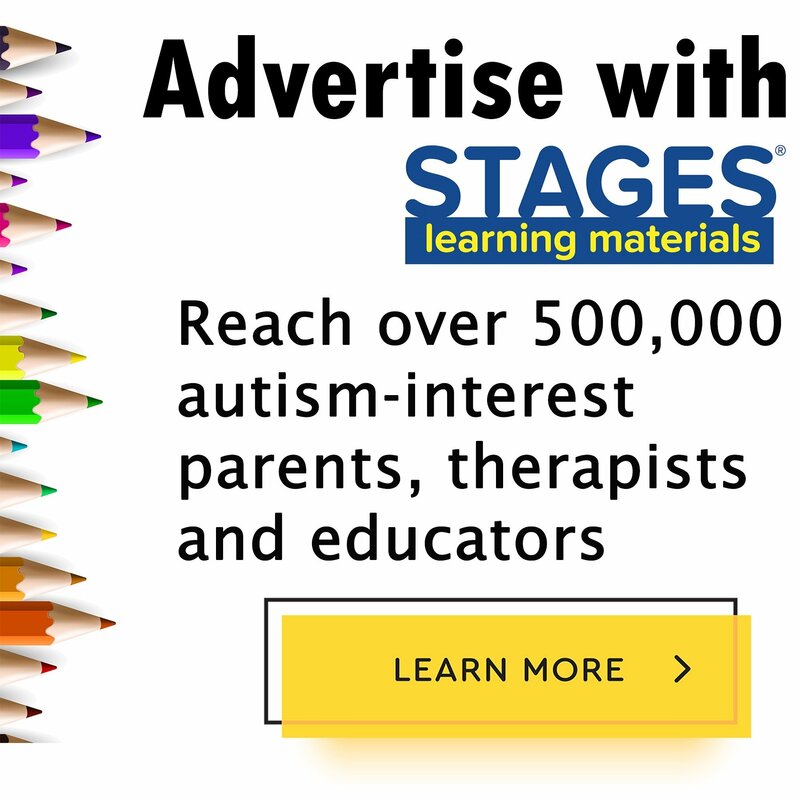 - Depending on your students, this may be a difficult task requiring cues from previous classroom discussions such as reminders to look at the model’s eyes or mouth for clues as to how they are feeling. 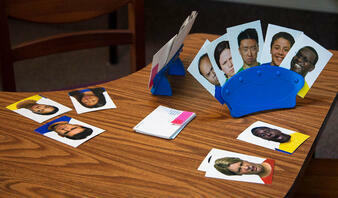 - Players can be prompted to put similar cards together in their hand to help keep track of the emotions they have. For example, all cards depicting happy can go together. - If a student has been dealt a match from the beginning (possible if it was decided that 2 or 4 cards make a match and each player received 5 cards), that player can group the cards in a pile and place them face up on the table. Before beginning game play, a staff facilitator should ask if anyone has any matches. Any student who has a match should show the cards they believe make the match and verbally identify the emotion the cards represent. After all matches have been shown (see step 7 below for more on confirming matches), students (or staff) can decide who will go first. - Students may require assistance to ask for cards from the other players. - Students with higher communication skills may form a complete sentence (“Bob, do you have any sad cards?”) and focus on making eye contact with the other player. - Other students may be working on speaking clearly, slowly, and loudly enough for their peers to hear and understand what they are saying. - The goal should be helping the students to interact with one another in a manner that is appropriate for each students’ skill set while also accomplishing the task at hand for game play, which in this case is asking another player for a certain emotion card. The student who was asked for the cards then looks at the cards in their hand and decides if they have any cards showing the emotion that was requested. If they do have the desired emotion card(s), they then give all cards of that emotion to the player who asked for them. If they have none, then the student making the request is told to “go fish,” and they draw a card from the pool and place it in their own hand. - Students may require assistance to appropriately determine if they have any of the requested emotion in their hand. - Some students may have difficulty determining if they have the right emotion (differentiating between sad and angry, for example), while others may simply not want to give up the requested card. - Students may also need assistance properly giving the card to the asking player. If they cannot physically reach the player, they could ask another student to pass the card to them. Students should be encouraged to pass the card to the other player, while making eye contact and saying something like, “Yes, here Alice” or even just, “Here”. - Again, the goal is helping the students to interact with one another in an appropriate way given their communication skills, while also supporting the turn-taking that occurs during conversation and advancing the play of the game. Then it is the next player's turn – unless the card drawn from the pool is the card being asked for, in which case it is shown to the other players, and that player gets another turn. Play proceeds to the left. When any player at any time has a match (2, 4, or 8 cards of the same emotion as decided upon before game play began), the cards are placed face up in front of that player. - The facilitator should then determine that the cards do all represent the emotion stated by the student. One way to do this is by removing the paper covering the words on the back of each card to reveal the emotion represented on the front of the card. - These types of questions can be asked at other times as well, such as when a student asks for a particular emotion (“Alice asked Bob for surprised cards. When would someone feel surprised?”), or any other time the questions and following discussion feel natural and helpful for the students. When all matches have been laid down, the game ends. The player with the most matches wins! 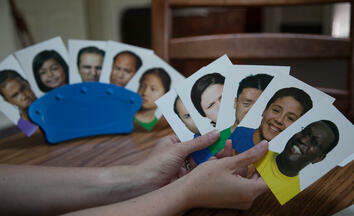 Want to learn more about the Language Builder Emotion Cards? Download a free sample of the cards below!